Home made food, truly made from scratch. Food made with passion and love. It’s the only way to describe the food fair found at Chuckie Bez in this 50’s themed diner where the waitresses know everyone’s names and the owner’s goal is to make everyone happy through their dining experience. What more could you ask for? Incredible food, tremendous atmosphere and a family feel. 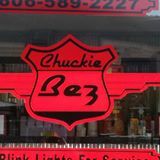 Get it all at Chuckie Bez!